1903: A new season brings new rules that generally require few adjustments to Nebraska's style of play. 1943: Former Husker guard Elmer Holm, an NU assistant coach in 1942 and former head coach at Washburn, joins Don Farouts Iowa Pre-Flight staff. «1968: Ben Gregory, rookie running back from Nebraska, scores the winning touchdown in his first exhibition game with the Buffalo Bills. 1973: Bob Devaney says he's not interested in pursuing an NFL coaching job. 1978: Johnny Rodgers nurses a strained knee while San Diego Chargers coach Tommy Prothro grows impatient. 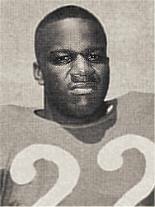 1988: The NFL suspends ex-Husker Doug Dubose for 30 days for drug abuse. 1998: Defensive coordinator Charlie McBride insists he has mellowed and Tom Osborne says he misses football as fall camp opens under new coach Frank Solich. 2003: Frank Solich exudes optimism as the 2003 Huskers open fall camp. 2008: Fall camp begins for Bo Pelini's first Husker squad.